They’re great for planting flowers or you could go wild and plant veggies in them! Safe from the slugs as they’re hung up they will provide a great place for plants to grow! 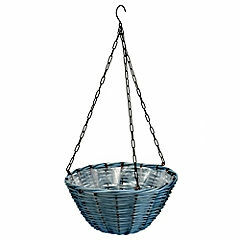 Made from willow and coloured a nice blue they will look good outside your home! Ideal for making your front door look lovely – have one hung either side. You can plant cherry tomatoes in these – there’s a variety that will hang nicely and you’ll be able to pick your own tomatoes from them! Don’t forget baskets and containers need regular watering but the use of water holding gel can help. You can even plant lettuces and other plants in them – trailing plants are traditional of course though!